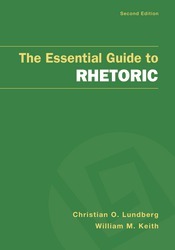 The Essential Guide to Rhetoric is a useful tool for students who need a brief, topical introduction to the field of rhetoric. This concise book covers both classic and modern rhetorical theory for students and professors who want to gain a further understanding of rhetoric and its practical applications. This guide provides an easy-to-read, jargon-free look at rhetorical theory and how it can be used to supplement an education in communication and public speaking. This guide and other guides in the Essential Guide series were developed to complement a wide variety of communication texts and course needs, offering instructors flexible options to add additional content or emphasis areas to their courses. The Essential Guides can be purchased on their own, packaged at a discount with other Bedford/St.Martin’s texts, or used as part of a custom option.